Knock knock. Who’s there? Not Boulder County Commissioner Elise Jones, because she doesn’t live here. That’s what happened early Sunday morning when anti-fracking activists staged a nearly hour-long protest at the wrong house in Boulder, Colo. This comes as a surprise since Jones is well known as an anti-fracking Boulder County Commissioner, and to have “Keep It In the Ground” groups target her is a misnomer for the movement. Progressive leaning Colorado Pols had a lot to say about the recent anti-fracking cannibalism taking place in Boulder. 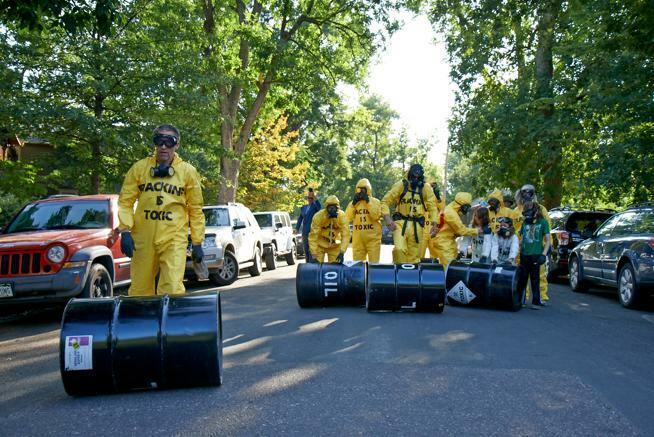 A new round of news reports details the ban-fracking activists who dressed up in hazmat suits and rolled prop oil barrels down the street in an attempt to give a wake-up call to Jones at what they thought was her home. 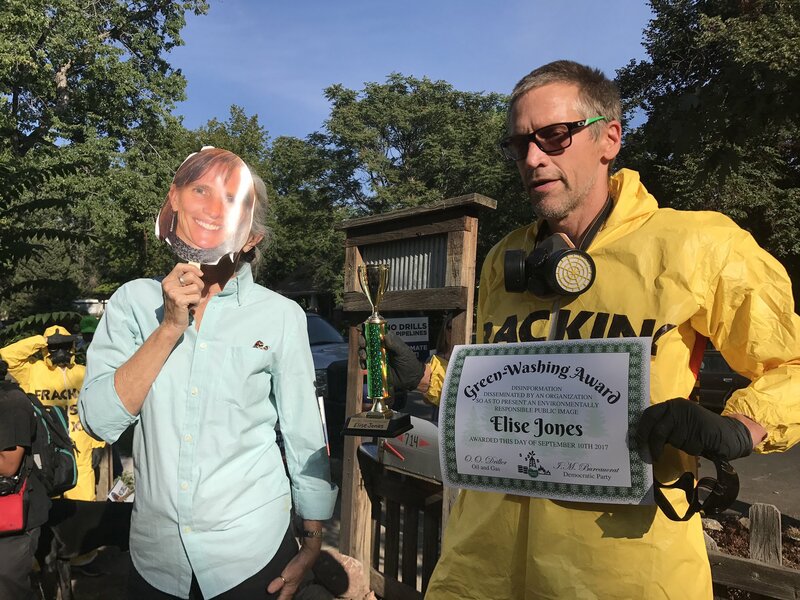 After the “faux Elise Jones” accepted the award, the protesters gathered on the lawn where they drummed on the oil barrel props and demanded Jones “recuse herself” as county commissioner. The entire protest ran its course without any of the protesters figuring out that the reason Jones wasn’t answering the door was because she doesn’t live there. It wasn’t until much later on after the protest ended that they realized that they had been at the wrong house the entire time. In a video posted by anti-fracking activist group East Boulder County United, Willmeng is shown knocking on the wrong door saying, “That’s your political future knocking.” Having twice knocked with no answer, the activists questioned whether or not Jones was home, but never once thought they had the wrong house during the protest. “Happily, no one was at home, but as you might imagine, the current residents were very confused when they came home to find an oil drum in the driveway and threatening chalk messages drawn up and down the sidewalk and the steps to the house,” Jones wrote. “I went over to apologize and to try and clean everything up,” she said. Jones said on Monday that while “we all object to fracking” — the process of injecting a mixture of sand, chemicals and water to free up underground oil and gas deposits — she objected to anti-fracking demonstrations that trespass onto private properties. Wait, so Jones just said that she too subscribes to the same anti-fracking philosophy as the group who sought to protest at her home early Sunday morning? Why would anti-fracking groups attempt to protest at the home of a fellow anti-fracking enthusiast? The answer has a lot more to do with what happened in May of this year when the five-year fracking moratorium in Boulder County ended, and now anti-fracking activists are seeking to pin the blame on Jones and a few other members of the Boulder County Commission. Contrary to the anti-fracking groups’ laments – Jones’ extreme anti-fracking stance in Boulder County led to what Energy in Depth reported earlier this year as the “legal quagmire” the Boulder County Commission found themselves in when Colorado Attorney General Cynthia Coffman filed a lawsuit against Boulder County over its series of moratoria. There’s a clear division in the anti-fracking movement that is keeping them in a holding pattern. But with or without the divide, anti-fracking groups will continue to keep on “knocking on the wrong door” when it comes to their attempts to ban responsible oil and natural gas development. This failed media stunt adds to the long list of mistakes on these Colorado anti-fracking groups’ rap sheet. At the end of the day, the law is the law and as it currently stands, trespassing on private property is unlawful and so is a ban on fracking in Boulder County.